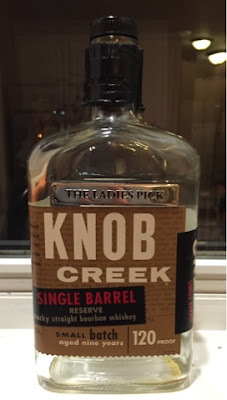 I previously reviewed a private selection Knob Creek Single Barrel that my buddy had picked up for me while he was at Liquor City Uncorked in Covington, Kentucky. That was hands down one of the best bourbons I've ever had, and I'm still blown away at the fact that it was a mere $35 a bottle. So, when he was going again, I asked him to pick up any new store selections that they may have, figuring I like their taste. This time he came back with what the store had labeled as "The Ladies Pick." Going in I knew that the bar was already set very high, but I was nonetheless excited to crack open yet another of their private selection Knob Creek Single Barrels. I also liked the name they had labeled on the bottle. Apparently, of the staff who were doing the tasting, this was the favorite among all the women. I attempted to use this feminization of my booze (at least in the label) to encourage my wife to give it a go. Even this couldn't convince her to join me in my enjoyment of whiskey. Oh well, perhaps that's for the better. As for the booze, though, although it did not quite reach that bar that I had set, to cut to the chase, this was a very good bourbon from start to finish, and, again, a great value considering the price. The high proof provided for a strong burn at first, one that hit on both the nose and the palate. I found, though, that just a bit of ice cooled it down pretty easily, and the flavors then really came forward. It's funny that, as I write these reviews, I feel like with many bourbons I say the same thing. But, I guess it would be concerning if I wasn't getting vanilla, caramel, toffee and brown sugar notes, or some combination thereof. The traditional distillers seem to know how to produce those traditional flavors, and this was no different, providing heavy doses of vanilla and toffee, with the vanilla lingering long after each swallow. The only thing I found slightly different in this bottle from the other private selection that I had was that this had more of a coffee flavor to it, albeit fancy coffee, loaded with sugar, steamed milk and french vanilla flavoring. Being one who will frequently partake in the enjoyment of such fancy coffees, I found this a very appealing characteristic of this bottle. While I still do not consider myself a big fan of Knob Creek, this is the second straight bottle of a private selection single barrel that I've really enjoyed! I may have to try one (or a few) of the Binny's private selections. Once again, for the price, you can't go wrong with this bottle.